The same police officer shot and killed a homeless person not more than six months before ending Braga’s life. This is an illustrative picture of how the military police operate in Brazil. According to official data, 161 individuals were killed and 138 were hurt by military police officers between April and June 2014 in São Paulo state alone. Mr. Braga became a statistic for the third trimester. Brazil still struggles with many security issues. In large cities, organized crime exacerbates a sense of insecurity felt across the country. While most crime is related to poverty and inequality, the solution by the government to militarize police is far from ideal. 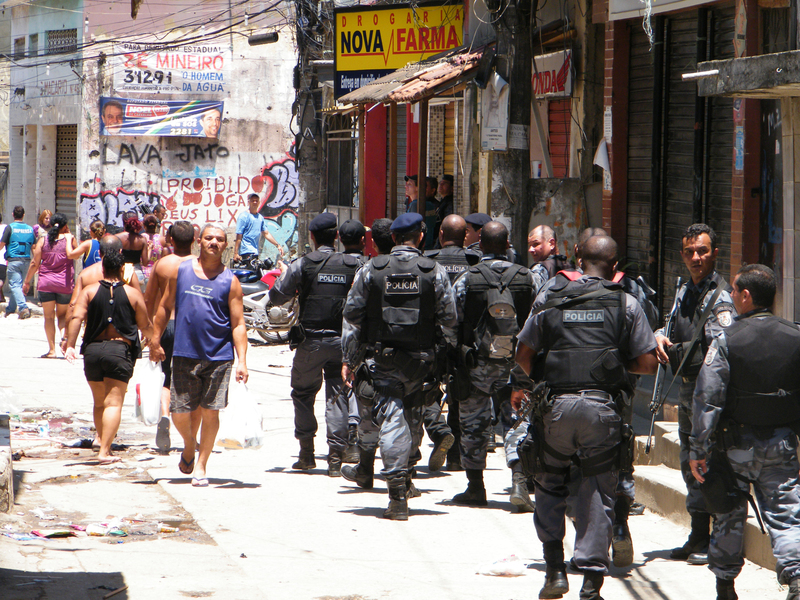 A police apparatus that bullies, hurts and kills Brazilian citizens is simply not the answer. The death penalty is banned by Brazilian law. Torture and other inhumane treatments have been prohibited since the end of the military regime in the 1980s. How is it acceptable that the law enforcement personnel can now break their own laws on the daily use of violence everywhere in the country? It is not okay. The function of the police is to protect its citizens, not to pose a real threat to their lives. Unfortunately, the Brazilian police have been failing in their duty to provide a sense of safety. The brutality imposed by the police and the impunity it enjoys is a heritage of the authoritarian regime that ruled the country for more than 20 years. Men and women with army training should not be dealing with the regular civilian population. The solution is to strip the police of their military status. Amnesty International released a report pointing that 80% of Brazilians fear torture from the police. Can Brazil be considered a democratic society with statistics such as this? Brazilian law should end the impunity in regards to the prosecution of crimes committed by military police officers on duty. By being part of the Brazilian army, the Military Police does not respond to the common justice regarding crimes such as homicide or bodily injury. On the contrary, they should be treated comparably to civilian police officers. State governments – to which these officers are subordinate – should put in place much more serious supervision structures. The responsibility to ensure accurate information also relies on the States. Serious human rights violations perpetrated by the police have been hidden and underreported. Bodily injury numbers often include non-reported cases of torture. The procedure to prove an act of torture (which involve a forensic medical certificate) is very rarely available to the victims of police misconduct. On the flip side, many policemen have been killed on duty all around the country. In São Paulo and Rio de Janeiro states the reality is particularly cruel due to the war on drug trafficking and other forms of organized crime. The main question to be asked here is: should the police be allowed to resort to criminal strategies to deal with crime and defend itself? The answer is no and the reason why is very simple. Police officers are state agents. Therefore, they must safeguard the law, not infringe it. If both criminals and state agents breach the law, the population is left helpless. As helpless as Mr. Braga was, as helpless as his family is right now. Carlos Braga, from the impoverished state of Piauí, migrated to São Paulo in search of a better life. He leaves behind his wife and four children. He worked for ten years selling pirated CDs and DVDs, which is illegal in Brazil. For that he received the death penalty. Illegal, unannounced, a summary execution. He had just received a job offer in his home state and planned to go back to North Brazil, bringing his family with him. His dream will not be fulfilled, his life was terminated and his family was shattered. But there is still time to avoid new tragedies like this one. A reform in the Brazilian police will finally enable it to represent the democracy it belongs to. Isabela Cunha is a Master of International Affairs candidate at the School of International and Public Affairs (SIPA) – Columbia University, concentrating on human rights and international organizations.